Nothing can prepare you for hearing those dreaded words. Whether you were expecting it or the news comes as a complete and total surprise, there is no way to absorb the shock, anger, frustration, disappointment and most of all fear. As a young woman I walked along this difficult journey with my mother and spent much of my time feeling helpless as opposed to helpful. As a nurse practitioner at Stanford for the past twenty years, I have shared those same words with my patients almost every week. While the options have become more the reaction (and reality) is just as scary. Here are four tips that have helped many of my patients and may help you to navigate this journey with a more clarity, confidence and courage. It’s probably not the first thing you want to do. You might be thinking “I just got diagnosed with a potentially life threatening illness, why shouldn’t my doctor or insurance company take care of this. I pay for insurance, or medicare….” yes, it’s true and it makes total sense. Except it just doesn’t work that way and if you want to have the best possible out come from the best possible providers for your specific diagnosis you are going to have to get involved. We live in the era of medical specialists and super specialists, and honestly this may not be the best time to choose the closest and most convenient provider. You want to trust your care to a trained specialist in your particular cancer if you can. If you live near a designated cancer center, go there! If you have an academic “teaching hospital” close by, go there; these institutions are often up to date on the latest research and may have clinicians who treat only your type of cancer. Generalists may treat cancers of the breast, prostate, lung, thyroid, lymphoma, myeloma; do you see where I’m going here? Having a specialist who treats only sarcomas, or leukemias or whatever your particular variety of cancer is assures you the best trained oncologists familiar with your disease and treatment options. Before you attend your doctor’s visit, gather your records and bring them along to every visit. Every MRI report, operative note, pathology report is not only helpful but critical. Spend five dollars, and purchase a three ring binder and fill it with all of your pertinent information. Never assume it will be at your doctor’s office when you arrive. As a cancer patient you will have a team of providers who participate in your care; potentially an oncologist, a surgeon, a radiation specialist among others. Your visits will be most beneficial if everyone has the information they need to provide the best care possible. I can’t tell you how many times patients show up assuming their records or xrays are available for review and when they have traveled a long way to see us it is very disappointing for everyone involved. Bringing a companion to every visit is worth so much more than just having company or a friend to help with the drive. Meeting with your doctor will mean receiving a lot of new information about your care and potential treatment options; some of this will be overwhelming no matter how well you are prepared. Bring a friend, a family member or if necessary an advocate who listen and take notes for you. 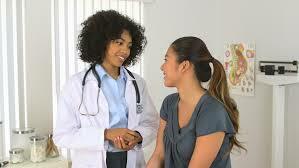 After the visit, you will be able to discuss your options more clearly if you can remmber when your doctor said. These visits can be long, and many options may be discussed or mentioned. Often in our surgery clinic, we encourage patients to record the session with a recorder or iphone and this has been very helpful in answering questions that come up on the drive home and also help alleviate confusion. You may need help adjusting to your new “lifestyle” whether that means time off of work, a handicap placard for your car or help driving your kids home from school. Asking for help isn’t easy for many of us, especially for women who are used to “doing it all”. Asking for help isn’t easy but it really is important so that you can focus on your health and recovery. Talking to a professional helps too; many cancer centers such as Stanford have mental health professionals who can help provide resources, psychiatrists and psychologists specially trained to deal with the specific challenges cancer can bring, and help you cope with some of the more difficult aspects of your health. Additionally there are social workers, coaches and advocates who are trained to walk with you on this important journey. Remember that you are your own best advocate. Your health care providers are here to support you, and it is important that you make your needs known. Talk about what is most painful or challenging, share what your hopes for outcomes are whether that means being able to travel or return to work or live independently. A recent study by one of the Stanford oncologists, Dr. VJ Periokoyl confirmed that sharing your bucket list can make a significant difference. Whether you are facing cancer, or supporting a friend or family member, knowledge is power. Arm yourself with resources and education and you’ll be suprised at how quickly you can become both an expert on your diagnosis and an empowered patient or advocate. Sign up to receive the Glass Slipper Notes! A dose of inspiration for real life heroes and healers.